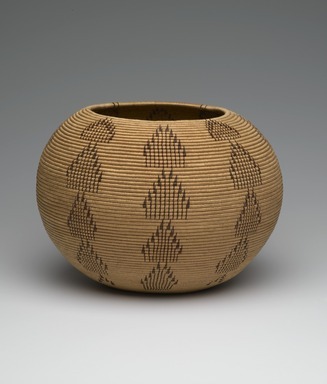 Coiled vessel of slightly elongated globular form and woven in shades of brown with arrowhead and grain motifs depicting "Hunting in the Harvest Time". There are twenty-nine stitches to the inch. This is called a degikup basket a larger basket that curves towards the top and totally covered by the design a spherical, non-utilitarian basket produced by the technique of coiling.- and totally covered by the design a style Dat So La Lee (Louisa Keyser) invented. The primary basketry material is willow (Salix spp. ), which is used to create the rods (warp) and the threads (weft). Bracken fern (Pteris aquilinium) and red bud (Cercis occidentalis) are the two primary materials used for the red and black decorative elements; both are processed into thread, which is spliced into the willow threads to create patterns on the light willow background. The three-rod technique, the form used originally and predominantly by the weavers of this period for the degikup, uses three willow stems to form the coils, which are curved along the horizontal plane and then sewn together with thread to create vertical height. Later artists switched to a one-rod technique, which produces a basket of somewhat less sculptural depth. The one-rod technique is less difficult and time intensive to produce, although not easy or quick by any means. The switch in styles reflected a response to the demands of the market. The provenance on this basket is definite (see provenance section). It is done in a style used for her major works between 1898 and 1916, involving a round shape, fine stitching (around 30 stitches per inch and either scattered or vertically arranged patterns of small design units. The arrow like forms are ripe grain, ripe harvest. the points on the end are arrow points for hunting.